The great response I received for “why we lie” has motivated me to think and write one more similar topic. Rejection Handling. All of us face rejection in many phases of our life. From school admission to job interview, from marriage proposal to loan request, we encounter rejections of various types in our day to day life. Whatever be the cause of rejection, the general impact is that we feel disappointed and repeated rejection leads us to depression. In this post I'm making an attempt to analyze the cause and possible solutions to over come different kinds of rejection. Rejection type 1: Theory of relativity: This is applicable to situations like job interviews and marriage proposals. The vacancies are few (in the later case its just one) and aspirants are many. In this situation if you're rejected it's more because of the fact that there were other candidates who were considered more eligible for the post than because you were not good enough. When competition is high the selector enjoys the advantage-he/she can select the best. No body wants second best. If you sit back and cry (or in worst cases commit suicide) because you were rejected by a company or an individual, no one will give a damn. Above situation can be overcome by any of these three strategies or a combination of them: 1. Enhance your competency, skills and other decisive factors so as to beat the competition 2. Find alternate or Compromise and settle for a lesser target 3. May be the other person failed to recognize your potential. Market yourself better. Rejection Type 2: Perception and attitudes: Some rejections are because of pre set mindsets and notion of people. "He's a mechanical engineer and may not be able to code well", "last year he had an accident, it may not be safe to hand over the car keys to him", "if I receive his call he may ask for favors, better avoid speaking to him" All these rejections are based on some assumptions/beliefs and other factors for which you may not be responsible directly. It takes consistent efforts to convince someone and change the way they look at you. They'll stop rejecting you only after they're fully satisfied with your abilities. Rejection Type 3: Rules and Regulations: Some of the rejections are simply because of non compliance with some of the guidelines/rules/regulations/policies etc. Your leave request is likely to be rejected if you have no leave balance. To overcome these, you either reposition yourself to comply with the norms or find a way to trespass them (often done illegally and not advised). Rejection Type 4: Purely Personal. Some rejections are purely due to personal reasons. The other person may just not be interested in you or has a bad impression on you or other compulsions or any other possible personal reasons because of which he/she might be rejecting you/your request. Very few straight forward people say NO directly and generally give a genuine reason. Most others give a clue that their response will be negative by their words and action. It's up to you how you want to take the rejection and proceed. Some of the personal rejections can be turned around by adopting tactics like begging/external influence/force/pressure/temptation/threat/pleading etc. While you may be able to get things done by these tactics, repeated use of them (i.e. forcing someone to do something he/she doesn't like) can be harmful to the relationship. Depending on factors like the importance of the person, the criticality of the request being rejected, the level of dignity you want to maintain, available alternatives etc you can decide how you want to proceed. Sometime you can afford to ignore this rejection while sometime you can't. This kind of rejections is to be handled by your interpersonal and negotiation skills. Also introspecting yourself and rectifying mistakes/shortfalls from your side, if any will help reducing this kind of rejections. Rejection Type 5: Incompetence: You're likely to be rejected if you don't meet certain expectations. Like you're expected to clear a test or else rejection is guaranteed. These days there're global standards for almost everything and if you don't meet certain expectations and benchmarks, you're out of the game. If you face this kind of rejection obviously you should focus on the benchmarks you've to meet and achieve it. No shortcuts. Type 6: Over Expectation: In some situations, we expect things we don't deserve and when we don't get it feel rejected. Consider these: A lady colleague in your office speaks freely with you on office work and next day if you invite her to movie or dinner, and get rejected, that's not rejection. You just expected too much. When people are not bound to entertain us, and our expectations can't be justified, we should learn to respect the other person and his/her decisions. You never finished your work on time with expected efficiency and you expect a promotion-be prepared for rejection. No one will show pity if you make this kind of rejections public. These are the six types I could categorize rejections into. Whatever is the type we definitely feel very sad and disappointed when we're rejected. We blame our fate, luck, time and almost anything and everything. We begin to hate those who reject us even though he/she may not have anything personal against us. Will that serve any purpose? 2. As far as possible overcome your deficiencies and ensure that you don't repeat the mistakes. The biggest motivation for a writer is that there’re people who’re willing to read what he/she writes. Add to that the publicity in a national newspaper and he/she won’t be on grounds. I was literally floating on air for few hours on Monday morning. There’s nothing worth boasting about all these but I was really happy yesterday. 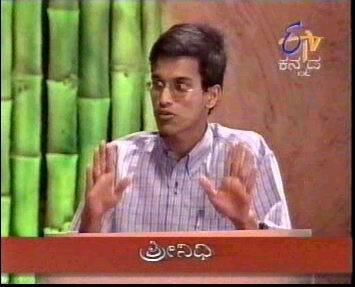 Last time my name was in media was way back in 2004 April when my article was published in Vijaya Karnataka. Two years is a really long time. Good Professional Article. I think it should definitely make into one the best Self Improvement books where there are few good books today, though for count there are many. Good read...keep posting such good stuff. Nicely put.. straight and precise. A well researched and well presented article. It is indeed good to hear that you have posted it in your blog and it is available for searchers. Posting it in MS again increase the number of readership. Regarding the pointof rejection, I believe nobody can reject us without our permission. I think it may be good to consider rejection as a symptom which require some work from us, taking responsibility for our actions, at the same time not permitting others to reject us without our obvious permission. Thanks for the comment and rating. ...nobody can reject us without our permission..
Not sure how can you prevent others from rejecting you...How we handle it and command better respect next time is in our control but ensuring that no one rejects us without our permission...how? I was only putting forward an ideal situation, which we should strive to attain. Once we judge our value and when we know our merrits, demerrits, pluses, minuses...and we place ourselves in the right position, which is very much our option...the place or people whom we are in touch cannot reject us unless their is an obvious charge against us which we failed to reconcile. 1. We are competent enough, but the other person reject one. This is an ignorance from the other person and you are not affected by it. The other person is not rejecting you in totality, but a part which he/she knows. The rejection is very much subjective to the understanding of the person, the level of ignorance and degree of bias. Again, it is not us they are rejecting, but they are showing their bias. We are no way going to permit others to defame our morales. In a college, when you apply for a post and when there is a vacancy for which you are most suitable and if the college reject you for no reason, the rejection is subjective to appeal. When you go to see a girl for marriage, you liked her, but she didn’t like you. In fact you are a brilliant guy, but in the shortest time she didn’t get your point across. She rejected you. We can quote this as an example, but the fact is that she is not rejecting you. Once you know that you have the talents she is looking for and she is a real asset, you will go all out to convince her, through friends, relatives, other ways to make change a mind. You get rejected the moment you feel she rejected me...but if you are thinking, she refused your proposal since she don’t know you the best part should be to convince her, where the initial rejection is not rejection at all. 2. We are not competent enough and we got rejected. When India go to Olympics we are not expecting to win all gold medals or even bronze medals in all departments. Still we go. We fight, our runners finishes as last. All audience across the globe pitty our runners. Is it rejection without our permission? We placed ourselves into an incompetent position. So, this is rejection with our permission. When we enter a space and time which is not ready to accept us, we are inviting rejection and we cannot put the burden on others. Jesus has said that we should not throw diamonds to pigs, not only for the reason that they don’t know the value of it, but they may turn against you. Take another example. Gandhiji was thrown out of train because of his colour. Did he accepted this rejection? He decided to fight this and rip apart the fallacy. He compelled the powerful to meet him as he is. On the otherhand, even now, in few of our villages, Dalits and tribes are treated as untouchables and most of them accept it as rejection. The result? They remain so. I believe we cannot be rejected without our permission. If anybody reject me not knowing me, I don’t feel rejected as I sumpothise their ignorance. If somebody reject me knowing me but not valuing me, I don’t care and believe me I must have rejected him/her before I enter into a dialogue with him, since I know they accepted their rejection before they say they rejects me. If I am being rejected for my ignorance, I have to humble myself and accepts the rejection, but to improve myself. Again, it is a temporary situation. Thanks Shri, for the opportunity to give my views...but I am sure you too carry a similar thought. HI Paul, I got your viewpoint now and agree with you. Thanks for the detailed explanation. Wonderful review enidhi....nicely summarised. Dut.....when rejected, it is uplifting to know you are not alone. Beethoven’s music teacher declared him ‘hopeless’ at composing. A teenager’s low popularity convinced her that she was not attractive. She didnt give up, became a top fashion model, and was hailed by many as the most beautiful woman in the world. All those who had ignored her are now boasting that they had gone to school with Claudia Schiffer! Very nice write up and its thought provoking too. You brought out some good points there.Keep writing! Srinidhi, As I commented before. your blog is well maintained and I did read this revu there. BTW, thanks for accepting the suscription. hi srinidhi.. lovely writeup, and loved the detailed analysis. and the tips were very practical. often in times of rejections ppl only work out of their emotions, and their intellect, pracitcal appraoch takes a back seat. and it requires a conscious re-programming of the mind, as shown by ur tips. eNidhi... read the post. Really cool. Its a very good article to read upon, Thanks for writing and motivating me through your work. Ravi Shankar, thanks for reading and commenting. Its my pleasure. Excellent article. I searched on Google for "college rejection handling" and happened to stumble your website. You have split the reasons of rejections into different categories, which assured me that the reason was not purely personal but vocational. Hey Shrinidhi, nice article. I am doing my 3rd year engg and I think this article will be helpful while attending for job interviews next year. Thanks for the post. And, congrats.. felt good when I read that this article appeared in "The Hindu".